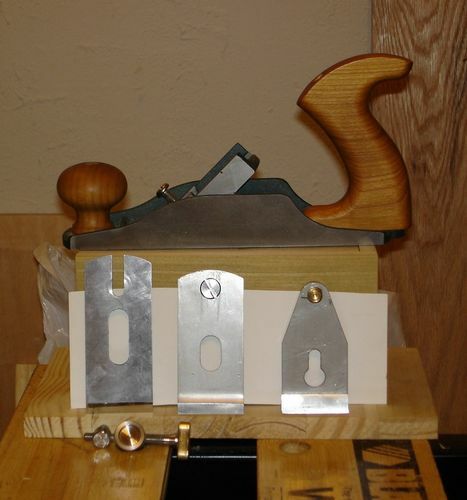 Why would I buy a Kunz plane? I blame it on Rob Lee (Lee Valley / Veritas) for not making a bevel down Number 3. I have been using a Wood River #3, but I like a full fisted grip. With my medium sized palm and small fingers, the Wood River #3 squeezes my hand when I use a full fisted grip. So after searching and translating many pages, I decided to try the Kunz Plus #3 which has an open tote / handle. A little background: I am not a highly experienced or professional wood worker. I am an amateur who likes to dabble. Also I don’t have any precision measuring devices, so the only thing I measured was the sole for flatness and the sides for square, using my Empire combination square. For this review I planed some boards (pine, poplar, oak and basswood) and made a box out of poplar a la Paul Sellers. Using the Kunz Plus #3 for flattening, jointing, end grain and smoothing. The Kunz Plus #3 is a well made plane. It just seems to me that they left out some labor adding finishing steps to hit a certain price point. The unique design of the blade assembly / adjustment I find interesting and useful in getting the blade out of the way, but it does bring with it an annoyance or two. In conclusion the Kunz Plus #3 is a better fit for me than the Wood River #3, so I am keeping it. Taking the Kunz Plus #3 out of the box, the screws were too tight so I took everything apart and checked for any major flaws. I didn’t find any so I put everything back together adjusting the frog, cap iron (chip breaker) and Norris adjuster. I was able to plane pine but the blade could use some sharpening. The sole was not flat, there was a slight hollow extending behind the mouth. I had read about this in other reviews, so I was looking for it. Before making the poplar box (and after planing some boards and deciding to keep the plane) I flattened the sole. I used 2 sheets of 80 grit sand paper, 1 sheet of 120 grit and 1 sheet of 220 grit. With the 220 grit it became apparent that a very shallow quarter sized hollow still remained, which doesn’t bother me. Note, In the picture showing the soles: top is Veritas small bevel up smoother; middle is Kunz Plus #3; bottom is Wood River #3. 360 degrees (a full turn) of backlash, this is an annoyance but not a functional problem. Part of this is caused by the blade holding / adjusting mechanism and leaving enough clearance to drop the cap iron screw into the large barrel of the Norris adjuster (see below under positives). Some machined corners were sharp, I eased / broke them with some sand paper. The knob and handle were fuzzy, like they were never buffed after being sprayed with oil (the finish on them). You could look at this as being ready to put on the finish of your choice, I waxed mine when I waxed the rest of the plane. Finding a position on the lever cap hold down screw where you are able to remove the lever cap and still be able to tighten the lever cap might be tricky (but does exist). I get around this (to keep the lever cap parallel to the hold down screw head). Using my fingers, to remove the lever cap I loosen the lever cap so that it is laying on the cap iron, then I loosen the hold down screw and remove the lever cap. To install the lever cap I partially tighten the lever cap so it is lifted off the cap iron, then I finger tighten the hold down screw, then I finish tightening the lever cap. The mushroom knob may catch some shavings because it is so close to the mouth. The tote / handle, I can use a full fisted grip and not have my hand squeezed. The mushroom knob, I like how easy it is to grab. The bottom of the frog is machined to fit into a channel in the body of the plane, so that it does not twist / turn when adjusting the frog. 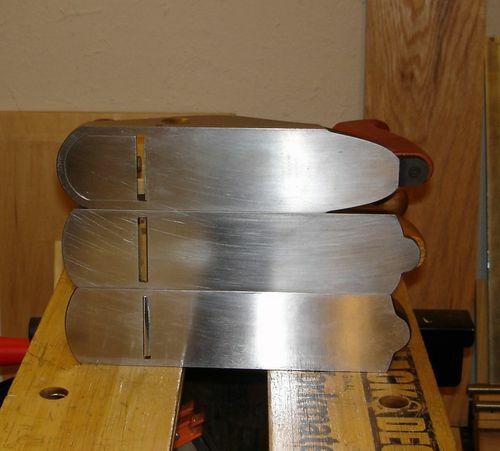 The back of the blade came flat (it probably took me as long to flatten ¼ inch of the Wood River #3 blade as it did to flatten the sole of the Kunz Plus #3 sole). The blade is slotted to accept the cap iron screw, so that you are less likely to burr / gouge the leading edge of the cap iron when attaching it to the blade. If you fit and set the cap iron close, this may mean something to you. The blade, cap iron and lever cap all move as one assembly when you adjust the blade depth. The head of the cap iron screw fits into the large barrel of the Norris adjuster. The brass screw for tightening the lever cap is hollow and fits over the end of the cap iron screw. Note: see the picture where the assembly is removed from the plane. Other than the sole having a slight hollow, everything appears to be machined well. There is a post in the casting that goes into the toe of the tote / handle, to keep it from turning. I like the retro 1950’s modern styling. The Norris adjuster can be adjusted to maximize the space between the depth adjustment knob and the tote / handle, by minimizing the number of turns needed to project the blade (turning the adjuster to project the blade brings the knob closer to the tote / handle). Adjust the frog to where you want it. Then spin the small barrel of the Norris adjuster on as far as it will go. Then doing a series of test fits, turn the large barrel of the Norris adjuster down (left hand thread), to where the blade is minimally retracted. The Kunz Plus #3 is lighter than the Wood River #3, and heavier than the Veritas small bevel up smoother. The brass cap screw holding the tote / handle on, is a ways into the handle. You could chop off a hunk of that large wing if you wanted to. The non-machined parts of the casting are rough, but they are also powder coated. The lateral adjustment is the reverse of my Veritas planes. The body is cast from gray iron. The leading edge of the cap iron / chip breaker is around 25 degrees. To adjust the frog, you loosen and then just snug the hold down screws, so that the frog can be moved with the adjusting screw. After I have done my test planing and adjusted the frog, I then tighten the frog hold down screws. 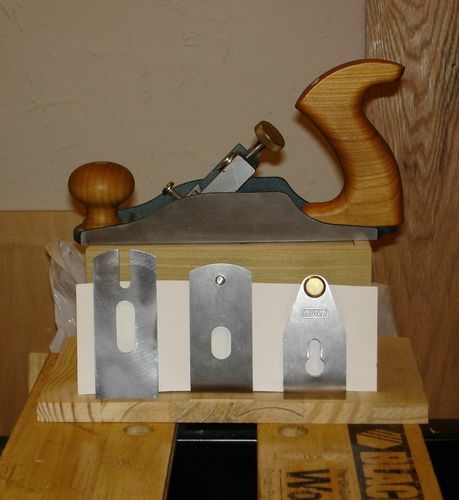 Interesting to see a good review of a Kunz plane. How thin of a shaving could you take with it, and what kind of surface does it leave in wild grain? It actually looks pretty well made from your pictures. Super thorough review. Thaks a lot! Truly an excellent review and an excellent job. Update your review after you used the plane for while, I would be interested to read it. How thin of a shaving could you take with it, and what kind of surface does it leave in wild grain? bobasaurus, sorry but I really can’t answer your questions. I haven’t planed any wild grain, and I mainly use softer woods like pine, poplar and basswood. As for the thinness of shavings, I have no way to measure. I can get thin shavings, as thin as I can get with the Wood River #3 and my Veritas 5 1/4W. But as I set those planes up also, it really is just a test of how I set up a plane. Nice review. Is it really necessary to remove the hollow behind the mouth as long as it doesn’t extend to far? I have a Kunz no. 80 scraper plane which I really like. It seems like a pretty good brand at reasonable prices. For me, it probably wasn’t necessary to flatten the sole. Before I flattened it, I planed a couple of boards with the Kunz plus #3, switching off with my other planes, and I didn’t notice any difference. But I knew I would always wonder whether it does make a difference, so I flattened the sole. Well, almost twice the price of the Wood River #3 (on sale), and just about the same as the Veritas small bevel up smoother sells for now. Or you could see what Highland Woodworking is selling them for, which is where I got the Kunz plus #3.